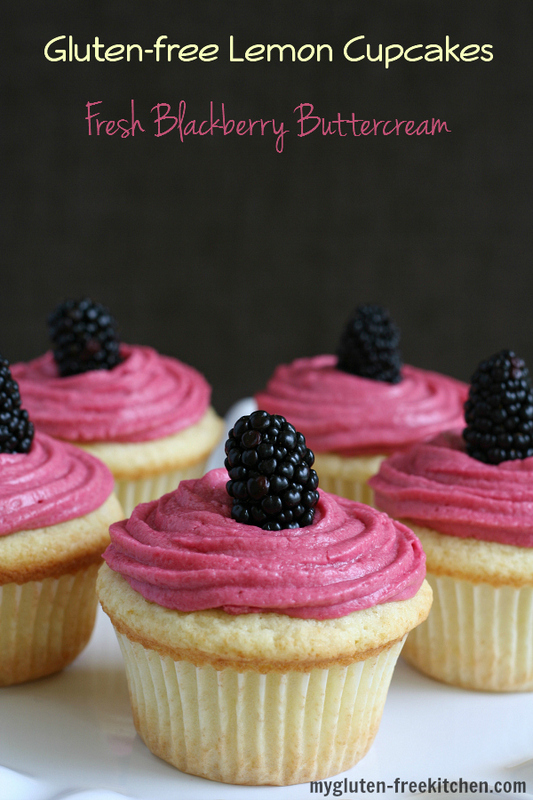 These beautiful and delicious gluten-free lemon cupcakes with fresh blackberry buttercream might look familiar to those of you that have been following me for a while. Last year, they appeared in an issue of the magazine Gluten Free Living. I promised that I would put them on the blog and then completely forgot! I was looking through photos for upcoming posts and saw these and thought I’d better get this recipe up! These have quickly become one of my favorite cupcakes. I’ve made them several times now, sometimes with this fresh blackberry buttercream, sometimes with fresh raspberry buttercream (same recipe, just using raspberries). I’ve mentioned before that we grow raspberries and blackberries in our backyard. They grow really well here with our hot Idaho summers. Frankly, they are pretty much the only thing I like about living in Idaho in July and August! I’m not lying when I say that about the only time I head outside during those two hot months is when I’m going out to pick our fresh berries. In the spring, before our berries are producing, I buy fresh California berries at our Costco. They are always delicious too! This buttercream frosting is so good, you’ll be looking for more things to put it on! I could eat spoonfuls of it, not that I have (ahem) before! Last summer, my boys’ first ever babysitter got married. Her new husband has found that he’s gluten intolerant, so she asked if I would make cupcakes for her wedding reception to serve alongside of their wedding cake. 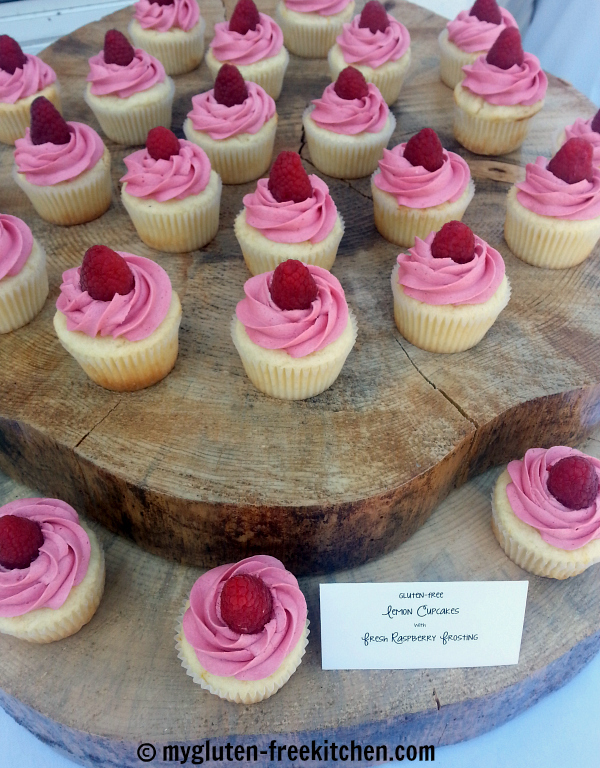 While I knew these cupcakes rock, I was nervous about making them for a wedding. It all turned out well. The cupcakes came out delicious, survived the curvy hour drive up in the mountains and sitting outside on a hot summer day. As with most of my recipes, I’ve tested these cupcakes with gfJules flour and also Gluten Free Mama’s Almond Blend Flour and recommend you use one of them. Feel free to use your favorite gluten-free flour blend and let me know in the comments how it works for you in this recipe! Hope you can make these soon! Preheat oven to 325°. Line standard muffin tins with paper liners. In a small bowl, whisk together flour, xanthan gum, baking powder & salt. Set aside. In the large bowl of your electric mixer, cream butter & sugar until pale & fluffy. Beat in the zest & vanilla. Add flour mixture in three batches, alternating with two additions of buttermilk & lemon juice, beating until just combined after each addition. Divide batter among lined cups, filling each ¾ full. I use a large cookie scoop/ice cream scoop to ensure equal sized cupcakes. Bake at 325° for about 25 minutes, or until a toothpick inserted in center of cupcake comes out clean and edges have just started to brown. Transfer tins to wire racks to cool. After about 10 minutes, remove the cupcakes from tins and allow to cool on wire rack. Using a blender or food processor, thoroughly puree the blackberries. Strain the pureed blackberries through cheesecloth or a fine strainer/sieve to remove the seeds. (Discard seeds) You will use 7 tablespoons of this puree. Slowly add 1 cup powdered sugar and beat until smooth. Add blackberry puree and pure vanilla extract and beat. *I have tested this recipe with gfJules Flour and also Gluten Free Mama’s flour blends. If you use a gluten-free flour blend that contains xanthan gum in it already, then omit the additional xanthan gum listed in this recipe. 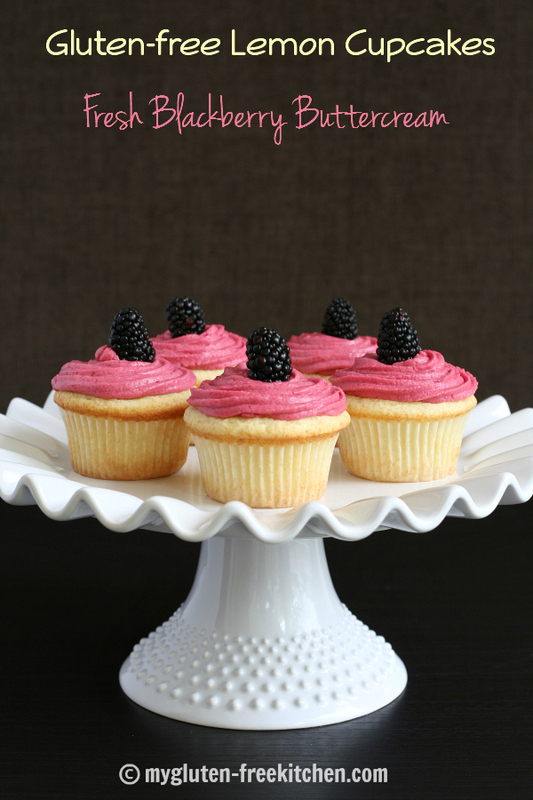 *Use raspberries instead for fresh raspberry buttercream. These cupcakes look absolutely irresistible!! I’d pick them up first over any other cupcakes on the table. I love that combination!! Lemon cupcakes are always a great idea in my book! I have a real soft spot for cupcakes lately! Your raspberry frosting sounds delicious, I need to give it a try! These cupcakes look so gorgeous and decadent! I’d certainly take 2 right about now with another cup of coffee! 😉 I don’t have a sweet tooth or anything. LOL! I’ve made these twice, and they are delicious. I used Bob’s Redmill Gluten Free Flour mix, so I didn’t add the xanthan gum as it was already in the mix. I scooped a small amount out of the top of each cupcake and put a spoonful of lemon curd inside prior to frosting with the blackberry buttercream. Yum! Your idea to add in some lemon curd is perfect! I bet those are so tasty! Oh Ashley, looks like I didn’t write that down! I’m so sorry! I will make a note to update this next time I make these. My guess would be 18-24 though, as that is what I usually get with most of my cupcake recipes! These cupcakes look delicious! I’m wondering if these can be made ahead and if so how many days before they start to go downhill. Thanks!! These cupcakes were amazing, I used Sir Arthur GF flour and they were moist and dense. This made a little over 2 dozen for me, so I will likely cut the recipe in half next time. Iced with vanilla buttercream and toasted coconut, so delicious, and people were shocked that it was GF! I just made these today, they remind me of pound cake or sponge cake, very good but my question is should they have this texture? I made these cupcakes yesterday, using Bob’s Red Mill 1-to-1 gluten free flour mix, and they were deliciously light and fluffy. Everyone enjoyed them, though only one person was totally gluten free. I did find that the amount of frosting was much more than I needed. I would likely cut the recipe in half for next time. This is the most amazing lemon cake that I’ve ever had! The lemon juice and zest is great! Thank you for sharing this recipe.